ANTIOCH — Sarah Rutan: To avoid long-term problems with a concrete driveway or foundation, it’s crucial to address drainage concerns prior to installation. Today we’re in Antioch with Diamond Certified Expert Contributor Russell Calhoon of Paradigm Concrete & Construction to learn more. ANTIOCH — Sarah Rutan: Prior to having concrete work done, make sure you’re getting the maximum value for your dollar. Today we’re in Antioch with Diamond Certified Expert Contributor Russell Calhoon of Paradigm Concrete & Construction to learn more. ANTIOCH — Sarah Rutan: When cleaning recently poured concrete, you’ll need to exercise caution to avoid causing accidental damage. Today we’re in Antioch with Diamond Certified Expert Contributor Russell Calhoon of Paradigm Concrete & Construction to learn more. 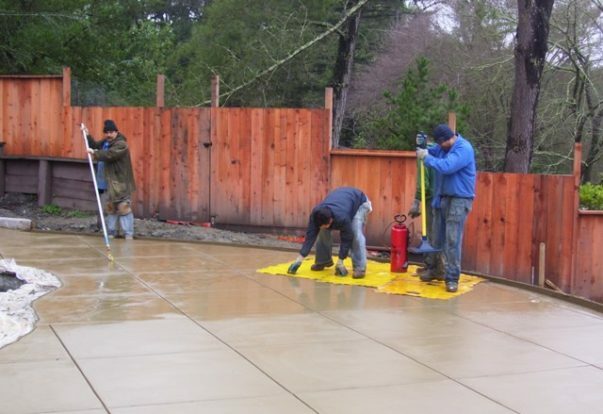 Most concrete contractors have a minimum charge for concrete work. If you only have one small project in mind, it might not meet that minimum charge, in which case you may end up overpaying to have it done. For this reason, it’s good to look around and see if there are any other small projects you can incorporate into the job. This will help you get more value for your money. SOQUEL — One of the most overlooked sources of potential damage to a home is inadequate soil drainage. When water is allowed to collect around the perimeter of a home, it can lead to numerous problems, including foundation settlement, termite infestation and the growth of harmful fungi like dry rot. As a homeowner, the most important thing you can do to protect your investment is control the groundwater outside of your house. CITRUS HEIGHTS — Host, Sarah Rutan: When laying concrete during a home project, one of the most common problems is cracks forming in your concrete. Today we’re in Citrus Heights with Diamond Certified Expert Contributor Gary Kluck of Quality First Home Improvement to learn one tip on how to prevent cracks in your concrete. Diamond Certified Expert Contributor, Gary Kluck: Concrete work, although it may look easy, its more complicated than you may think for sidewalks, driveways, patio covers.